Pod De Deux explores current issues and trends in the dance community through frank and relaxed conversations with dance-makers. Guests include dancers, choreographers, administrators, and anyone else with a firm connection to the dance world. This is not a strictly interview-style show. We seek to understand our guests’ experiences through an honest back-and-forth that will ultimately be more thought-provoking and spirited than a simple Q&A. Jessica Williams – “Hip” Brooklynite who works as a non-profit grant-writer by day, explores Gaga improvisational dance technique by night, and has been known to perform the entire Thriller dance upon command. Clara Peterson – Reluctant Astoria-dweller who works for a live-streaming company by day, produces fancy 0-budget web series by night and recently dreamt about doing 8 pirouettes. 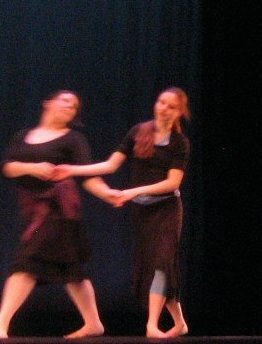 *This podcast is the latest in Jessica’s and Clara’s ongoing, unofficial series of dance-related schemes!